"Over the last fifteen years, I have developed a training philosophy that is applicable to junior high QB's all the way up through pro QB's . This 5 Tool QB system is designed to focus on the 5 core fundamental principles listed below." "To find out how and why we do this, please contact me at creemorris@yahoo.com to set up your training session and lets get started." 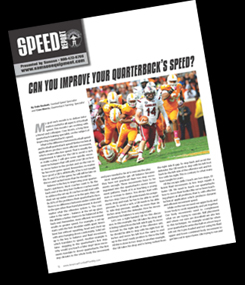 CAN YOU IMPROVE YOUR QUARTERBACK’S SPEED? Quarterbacks must be able to lead by themselves, be a self-starter and motivator. You do not have to be a talkative guy to do this. Sometimes you can lead by example. Do your teammates respond to the QB in the huddle and on the field? Teammates need to be able to trust their QB. The QB is the first one on the field and last one to leave. The QB must be willing to assist all teammates on the field, film study and in the playbook. The ability to quickly understand and be the first to recognize what is happening on the field is essential. The QB needs to know what to look for and why. He must process what he sees and react quickly. It’s the processing of information and quickly making a good decision that is at the core of knowledge for the QB. The QB must be able to understand the defense first and then, his own offense. The QB must be a student of the game. QB must understand how to prepare for games including opponent film study. The QB needs to develop a study guide for what to look for and how to break down film. Mental and physical toughness is what everyone respects. QB needs to be the best competitor and be at his best under pressure. Not only take a hit with a player barreling down on him but also the abuse from the coaches, fans and media that come with the position. Quarterbacks need to stay mentally calm and flat line as I call it and not crumble under the pressure of the position. To play QB the player must have consistency in drops and hand offs. The QB must have balance when he sets and throws, which is essential for timing with receivers and protections. The QB must be able to execute the footwork required for their offense. Whether we run or pass, our feet have to be in the proper position to make the play. Regardless of height, speed, or arm strength the ability to be consistently accurate is the most important attribute a Quarterback can have. Is the QB able to throw accurately to his target on time and efficiently do it time after time? Quarterbacks do not have to have huge arms to be successful. There are many examples of pro, college and high school quarterbacks to support this. Accuracy comes through consistent footwork and putting our bodies in position to make good throws. Quarterbacks throw to spots to where the receiver is going to be.